By Nancy Mauro-Flude, May 12, 2017 at 5:49 am . INTERCEPTIONS CNM Student Interactive Media Design Capstone Project with Director Nancy Mauro-Flude (Artistic Director) showing Tan Pin Pin (Guest of Honor) the computational Arduino platform that operates one of the artworks at the Interceptions – 2017 ArtScience Museum. Interceptions was held at ArtScience Museum Singapore – a series of Random Blends 2017 the 9th annual Department of Communications and New Media (CNM), National University Singapore Media Design Showcase. This year the theme Interceptions is a creative forum for radical thinking about the dynamic role new media and communication play in the world today, where digital art and culture fuses with community networks. Devised by the interactive capstone media design forth year students exhibiting works of students, alumni and faculty members from CNM, the showcase examines the ingenious ways practice-based interceptions have impact. Interceptions arises from an understanding of how provocative questions, communicated by the critical use of networks, can be raised by play and novel modes of social engagement. Featuring poetry, critical game art, augmented reality performance, data as an artistic medium, sequencing of bacteria in biologically inspired salon simulations, site specific transmissions, networked art forms, and social media activism. 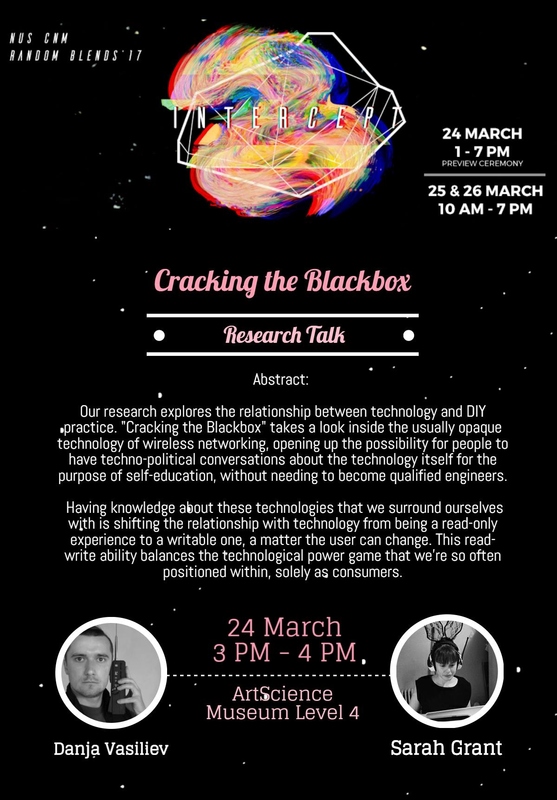 The 2017 Random Blends – the annual Department of Communications and New Media (CNM), National University Singapore showcase. This year the theme Interceptions was a creative forum for radical thinking about the dynamic role new media and communication play in the world today, where digital art and culture fuses with community networks. Devised by the works of students, alumni and faculty members from CNM, the showcase examines the ingenious ways practice-based interceptions have social impact. Interceptions arises from an understanding of how provocative questions, communicated by the critical use of networks, can be raised by play and novel modes of social engagement. Featuring poetry, critical game art, augmented reality performance, data as an artistic medium, sequencing of bacteria in biologically inspired salon simulations, site specific transmissions, networked art forms, and social media activism. As new member of the CNM it was an honour to be appointed head of Random Blends. However, to take on the obligation of shifting conversations through art is no small feat. There is no doubt that being granted the ability to showcase an event at ArtScience Museum opens up an incredible opportunity for the CNM community to demonstrate the genuine impact of our actions in the wider public sphere. This event is also practiced based creative arts research for our CNM students, whom at the end of their undergraduate phase are able to galvanise the importance of collaboration and learning how to work together to compose something that is greater than what their individual efforts produce. As a study module, it is formally titled ‘Interactive Media Design Capstone Project’, which examines the nexus between art, design and technological innovation. 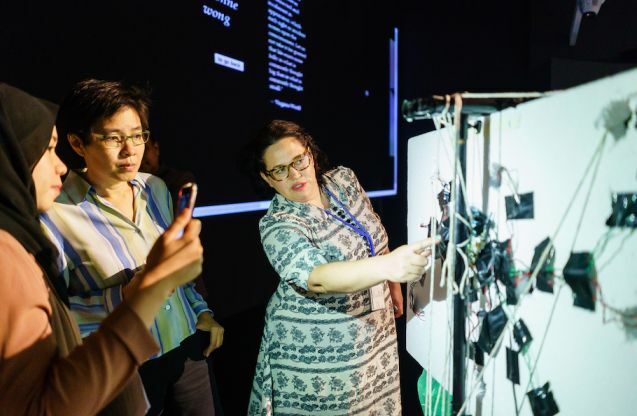 The 9th edition of Random Blends – Interceptions – returned this year as part of the Sunday Showcase programme, a public programme of the iconic ArtScience Museum at Marina Bay Sands. The annual tertiary creative arts showcase, organised by the Department of Communications and New Media (CNM) under NUS’ Faculty of Arts and Social Sciences, received a record total of 2,651 visitors, a 29% increase over from last year’s turn out. Notable was the diversity of the members of the public fascinated by the CNM’s ability to combine delicate civic agendas into media design, experimental computer games and new media. Mike, a businessman from Florida, expressed how his expectations were exceeded and that it was a “one of a kind experience and encounter” as the artistic nature of the showcase incorporated a deeper engagement with the social issues present in Singapore’s society. One of the most popular exhibits was “Revisioning”, a creation by 4th year CNM students Hafiiz Karim and Arumi Ho. It is a 5-part series of interactive posters that juxtaposes contrasting messages and imagery which viewers could observe by holding up and looking through filters, creating another lens to see through and enacting a wider perceptual shift in the embodied interaction. The enthusiastic public validation, especially from unsuspecting visitors, represents an indelible success for Random Blends 2017 which would not have been possible without the continued support provided by ArtScience Museum. The focus on curation and cultural leadership also gives reference to historical examples of artists and critics who were engaged with new technologies and social change in earlier times. Art distracts and art is received in distraction, but we must perform ‘new tasks of apperception’ wrote Walter Benjamin (1936-9, p. 269) these undertakings resonate through the creative processes demonstrated in the showcase. It should be noted that the term apperception is used within this discourse to refer to the self-awareness of the perceiving subject, in distinction from the object-orientated process of perception. Meanwhile, the convergence of materials and mediums – the training ground of distracted reception has migrated from painting to cinema to television and again to the multitudinous sites and social functions of computational media. The Internet carries in its wake, an ambient networked transglobal awareness simultaneously present in our embodied locale. Consequently, the showcase produces a renewed and new historical interest in refreshing parleys of apperception held up for reappraisal. Engaging in a manifold of play upon and reflection of our global predicament where displacement threatens our implacement at our every turn. It is not an exaggeration to say that far too easily many of us may even find ourselves in a place we never intended to be. This ineluctable uncanny feeling of not being at home is endemic to the human condition, intrinsic to habitation itself. Presenting vastly disorientating experiences in various ways, the showcase stimulates and encourages the audience to adapt themselves to alternate aesthetic forms of self-awareness in order to perceive the artistic intention. The Interceptions showcase reveals even a board game, usually a most accommodating presence, may alienate us. However raw and politically orientated these messages may be, when placed in the realm of the gallery they have the potential to lead us into the world of wonder which transforms utilitarian perceptions into something of profound significance. The artworks and projects are without question diverse – but as a whole what unites the collection is their ability to transform materials into astonishing and often perplexing works of ingenuity which raise deep-thinking questions about the world and our position within it.